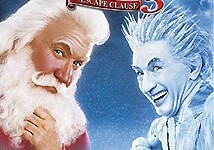 Holiday magic mixes with comical chaos at the North Pole in "Santa Clause 3: The Escape Clause". Tim Allen reprises his role of Scott Calvin - AKA Santa - as he juggles a full house of family and the mischievous Jack Frost (Martin Short), who is trying to take over the "big guy's" holiday. At the risk of giving away the secret location of the North Pole, Scott invites his in-laws (Ann-Margret & Alan Arkin) to share in the holiday festivities, and upcoming birth of baby Claus with expectant wife, Carol, - AKA Mrs. Claus (Elizabeth Mitchell). Along for the adventure are Scott's extended family, son Charlie (Eric Lloyd), ex-wife Laura Miller (Wendy Crewson), her husband, Neil Miller (Judge Reinhold) and their daughter, Lucy (Liliana Mumy) who, together with head elf Curtis (Spencer Breslin), foil Jack Frost's crafty scheme to control the North Pole.